Another view of what I'm trying to work out. 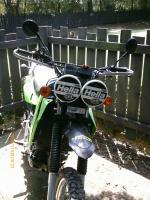 Dual Hella 500's on the play bike. #69 Baja posted in old buggies post. This is what I'm trying to accomplish, kind of a lower plainer look. I will add some lights and such and beef up everything, but this is what I like.